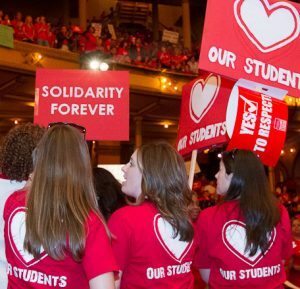 Today’s vote demonstrates a nearly decade-long fight for an elected, representative school board, anchored in the work and collaboration of the grassroots education movement and the Chicago Teachers Union. The Union first put this measure on the ballot in 2012, and again in 2015. 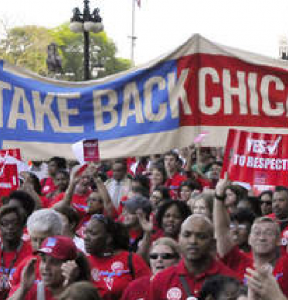 This measure has long had the overwhelming support of the citizens of Chicago, and represents resistance to the austerity of neoliberals like Bruce Rauner and Rahm Emanuel, who worked hard to destroy schools in Black and Brown communities, fire Black and Brown teachers and defund our school district. We thank Speaker Madigan and Rep. Martwick for their support, and are hopeful that Sen. Aquino, with the support of Senate President John Cullerton, will get this bill on Governor Pritzker’s desk so he can fulfill his commitment to signing it. Mayor-elect Lightfoot’s support of HB2267 will be measured in how she appoints the board she will now lead. Will her Chicago Board of Education be led by the same corporate interests that served Richard M. Daley and Emanuel, or will it be truly representative, with stakeholders who are the very people living in communities and neighborhoods that have lost the most under the racist influence of neoliberal school leadership? The passage of this bill will only be strengthened with a massive investment in our school communities, where an equitable distribution of resources has been non-existent under Daley and Emanuel. We expect Mayor-elect Lighfoot’s support for this measure, just as we expect her to undo the disastrous #NoCopAcademy contract and Lincoln Yards deal. The revenue committed to these projects must be directed to our school communities for paraprofessionals, librarians, nurses, clinicians and social workers.